Camera model: Nikon D4, Exposure time: 1/500s, Aperture: F4, ISO speed: 400, Lens 300mm Telephoto It’s the first time I’ve photographed the Tuesday night football and I enjoyed it; we literally turned up at the football straight from the plane with our bags and everything! I didn’t even know Novak Djokovic was playing to be honest until I saw him on the pitch – he didn’t turn up until five minutes before and played the whole match. We got some nice pictures and having not shot football before I was quite pleased with my results. Here you’ve got two guys at the top of their respective sports playing a different one altogether as Fernando holds back Djokovic while Perez looks on. It was a good charity event and I’m glad I got the shot; it was a great way to start the weekend. Top image – Camera model: Nikon D4, Exposure time: 1/640s, Aperture: F8, ISO speed: 400, Lens 24-70mm Zoom Roscoe was quite funny because we missed him in Barcelona and getting a photo has been on my list for ages! 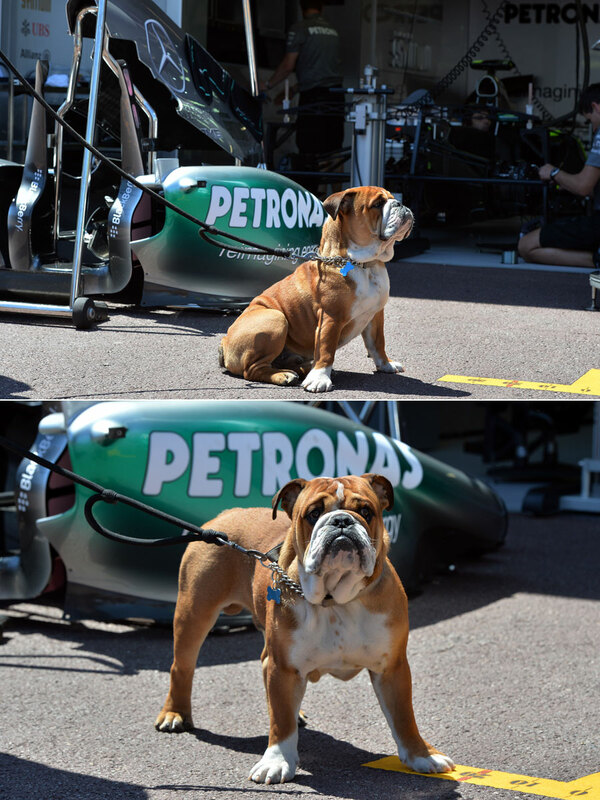 In Monaco Lewis was walking round with him quite openly, and this was great because Lewis went to the toilet and was upstairs for a bit and Roscoe stayed there guarding the garage! Then he took him down to the first corner for a wee as there’s a little grass area there before he took him in to the paddock. It’s just a great shot of him guarding the garage – I’ve had to crop out the names as it said Nico Rosberg above the garage but it is actually Lewis’ side he is in front of – and he’s waiting for him so obediently. Then I shouted at him and he looked over at me. Camera model: Nikon D4, Exposure time: 1/2000s, Aperture: F7.1, ISO speed: 400, Lens 70-200mm Zoom I shot the start from a hospitality suite courtesy of my friend Dave – I need to thank him but don’t want everyone asking him for access! – and you can get so much from up there. I could see Chilton coming out of the chicane and I got it right from the very beginning because I was following it the whole way. I think it’s the first time I’ve used the 12 frames per second mode on my Nikon D4 and something like that is where it really comes in. I just kept my finger down and got it from when they touched right through to the end. Camera model: Nikon D4, Exposure time: 1/1000s, Aperture: F8, ISO speed: 200, Lens 10.5mm Fisheye This is from the same point as the crash sequence so again thanks to Dave who runs a hospitality suite; it’s a great place for me to be. You can get the start, the run up to Ste Devote, out of the tunnel and through Tabac and the swimming pool section all from one shot. 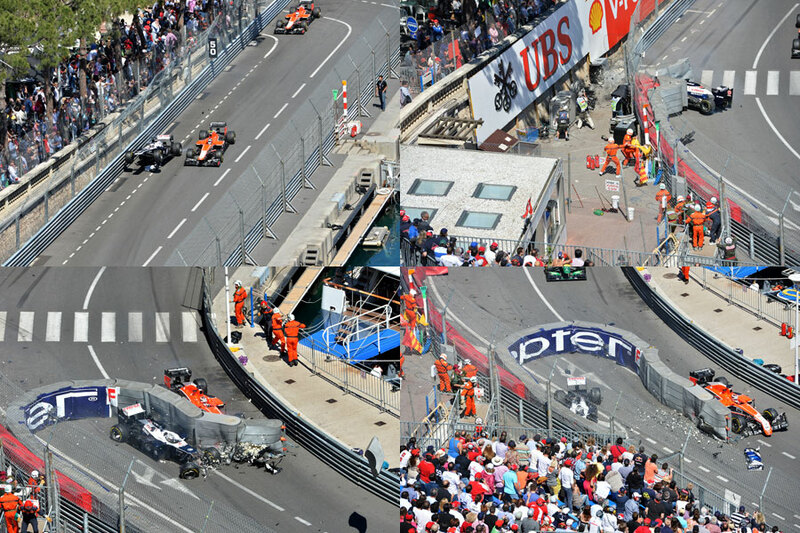 I shot the start here last year with Grosjean’s crash which was great, but I like getting up in the buildings and am always looking for new locations to shoot from. 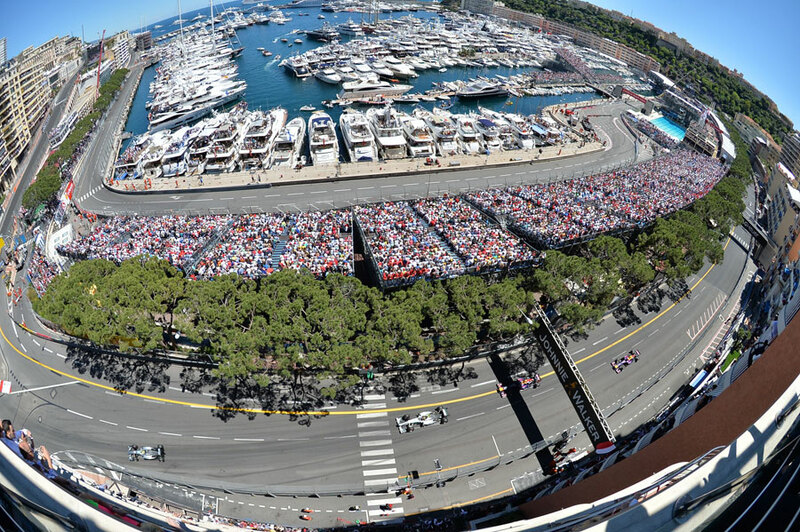 This is with my new 10mm fisheye lens, which just enables you to get the whole of Monaco in from there. Camera model: Nikon D4, Exposure time: 1/320s, Aperture: F8, ISO speed: 800, Lens 24-70mm Zoom I like this shot because someone lit it with their flash from the side and the champagne has just started being sprayed. 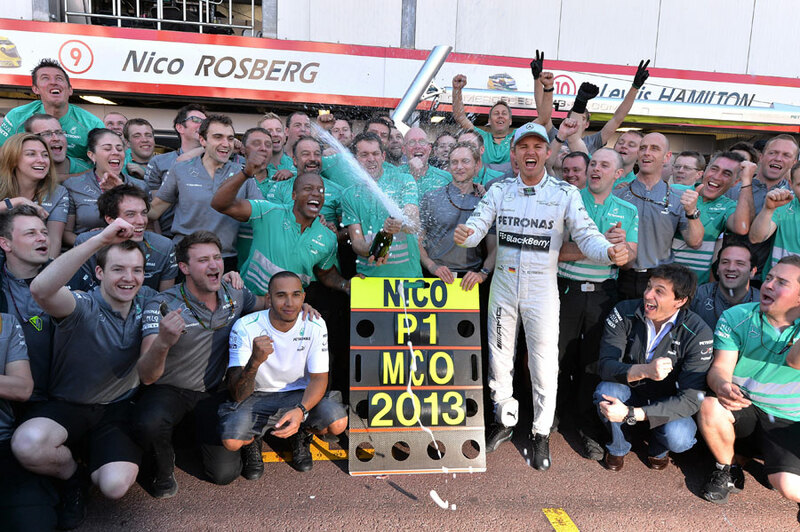 Rosberg had just come from the interview pen and the guys were celebrating with him. We didn’t need the trophies with it because the pit board and the emotions told the story, and it was good that Lewis was there and joined in even though he wasn’t happy because he didn’t make it on to the podium. It’s a tight pit lane and the boxes all had to be moved to make space to do the shot. Afterwards Rosberg was lifted up on to the shoulders of his team members and it was just a good little celebration. Camera model: Nikon D4, Exposure time: 1/125s, Aperture: F5.0, ISO speed: 400, Lens 24-70mm Zoom This was after the race, and it was a real privilege to have Seb using our photos. He’s one of the few grand prix drivers who are in to the history of the sport and he’s ordered lots of prints from us of all the world champions. I didn’t get a chance to ask him why he chose the 1960-61 photos – it was all to do with Stirling Moss – but he had this one-off design for Monaco and he used our pictures. They’re all from the Sutton Archive taken from David Phipps who started in 1960 and retired in 1985. We bought the archive back in 2000 and these actual pictures we only found two years ago because they were large format and much better quality. 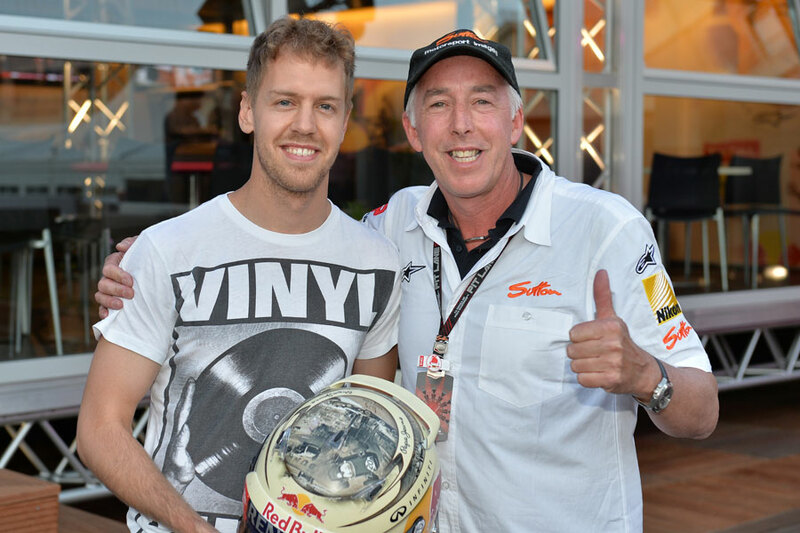 The whole helmet got huge publicity and we were very honoured that Seb used them.